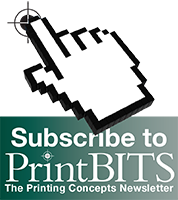 PrintBITS May 2013 - Printing Concepts, Inc. The ability to manage variable data. Research has found that good packaging contributes to convenience, which improves customer satisfaction. Package design has a crucial role in the last moments of a consumer’s decision to make a purchase. It is often the most important and most overlooked aspect of marketing. In the last 10 seconds before the purchasing decision, consumers view packaging as a motivation to buy. Market research supports this. It’s the packaging of the product which is most crucial for marketers. Research on good packaging reflects several rules-of-thumb, all of which focus on customer satisfaction and retaining brand identity. The last 10 seconds is the crucial part of a buyer’s decision. The evolution of the smartphone is actually bringing print and digital closer. Printing Concepts can offer cutting-edge digital services that can boost online and print responses. You can achieve all of this with today’s top print to digital technology…from QR codes and NFC (Near Field Communication) technology. What these two technologies have in common is a way to link traditional printing to digital technology. By combining print with online communications, printers can bring added value to their customers.